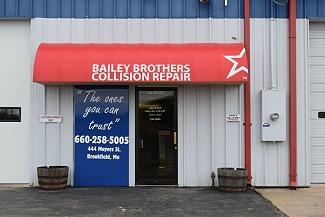 Bailey Brothers Collision Repair is located adjacent to Smith Ford in Brookfield, Missouri. From Highway 36, take exit 11 (S. Main) in Brookfield, turn north and go to the second traffic light. Continue on S. Main as it turns to the left and becomes N. Forrest Drive. 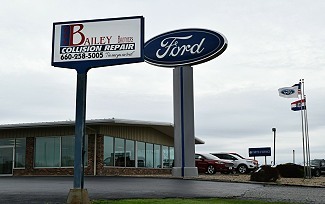 Turn into the Smith Ford parking lot and continue to Bailey Brothers Collision Repair.